Since it was founded in 1909, LDBC has been a Christian Camp. Each day begins with a service in the beautiful St. Joseph’s Chapel. It is a time of peace, beauty and inspiration for campers. The Chapel organ is one of the finest historical organs in the country, and some of the leading young organists and choir directors in the country have come to direct our renowned Boys’ Choir. The worship in St. Joseph’s Chapel are the services of the Episcopal Church. 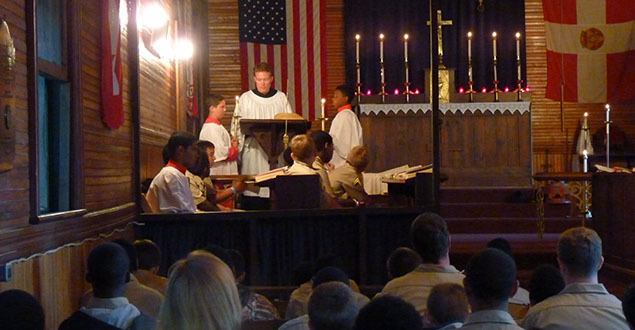 Campers and counselors are not required to be members of the Episcopal Church or of any other religion at home. Campers and counselors are expected to attend and participate in the services while at camp. At the end of each summer, campers and counselors alike, whether religious at home or not, tell us how much they were moved by the LDBC’s Chapel experience.